THE HAGUE - Chinese Premier Li Keqiang reaffirmed pledges Monday to open up his country to foreign investment as a way of promoting commerce between his country and the Netherlands. However, Li said nothing about trade policies that are the target of U.S. and European complaints and have triggered a damaging trade war with Washington. Pointing to deals done in July with German companies, Li said his government would fast track Dutch applications to establish themselves in China. Li said he expects contracts worth $10 billion (8.6 billion euros) to be signed between Dutch and Chinese companies during his two-day visit to the Netherlands. 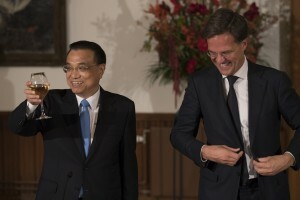 Li spoke after a ceremonial welcome at the Dutch parliament and talks with Prime Minister Mark Rutte. He was to meet King Willem-Alexander later in the day. Li and Rutte said they discussed multilateral trade but not specifically Beijing’s trade dispute with the administration of U.S. President Donald Trump. The feud has been fueled by U.S. accusations that China engages in cyber-theft and coerces foreign companies into handing over technology in return for access to the Chinese market, as well as by Trump’s anger over China’s trade surplus with the U.S.